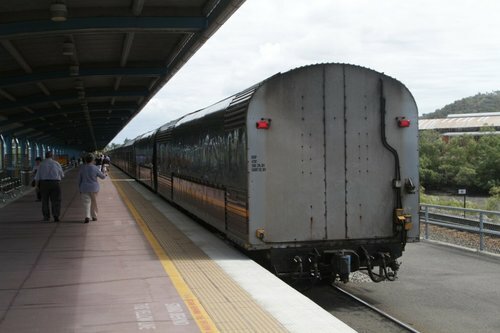 Great Southern Rail offers a motorail service on all three of their services – Indian Pacific, The Ghan, and The Overland. Their wagons have enough room to fit eight small cars aboard, split across two decks. 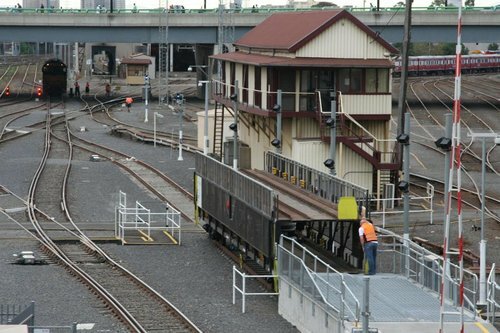 Loading and unloading cars takes a lot of messing around at each end – the wagons needs to be uncoupled from the rest of the train. Then pushed up against the unloading ramp. And away for the owner to pick up. 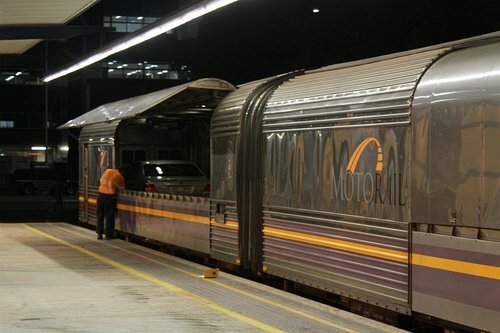 Queensland Rail also offers motorail service on their long distance locomotive-hauled services. 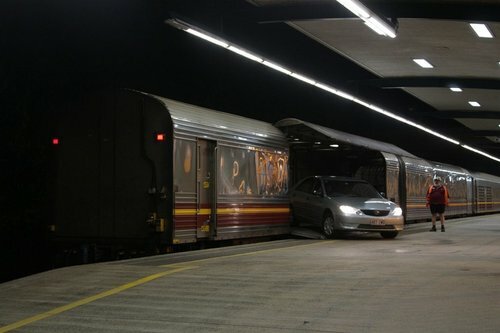 However their car carrying wagons blend into the rest of the train. Each wagon has a pair of doors on the side. The top ‘gull wing’ door opens upwards. While the lower door moves downwards to form a ramp. With the wagon parked right beside the passenger platform, there is no need for any shunting moves. 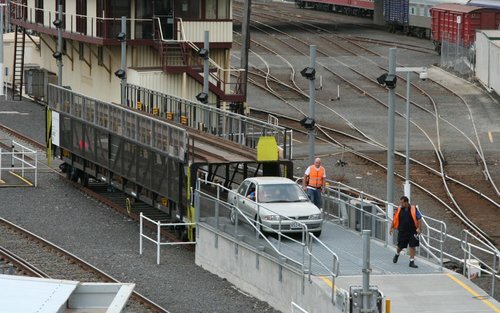 Allowing cars to be driven straight off the train. Note that the above Queensland Rail example is from the Sunlander service – come December 31, 2014 the sleeping train service will be replaced by the slightly faster Tilt Train, which has aircraft style lie-flat beds. So most of the cars traversing from the west to the east of Australia and back again don’t travel by train? 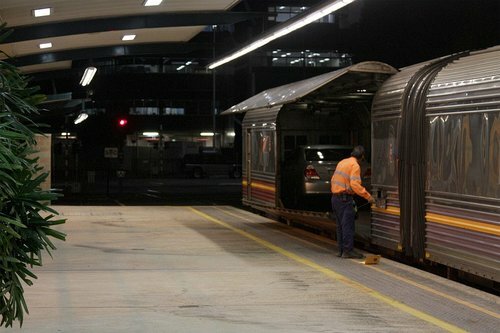 Getting your car onto a train should be a no nonsense process and very interesting that Queensland does it well. 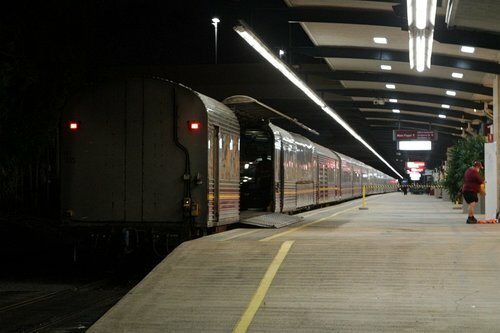 On the Indian Pacific and The Ghan trains passengers can take their car, with a number of car carrying wagons being attached for the larger number of vehicles. 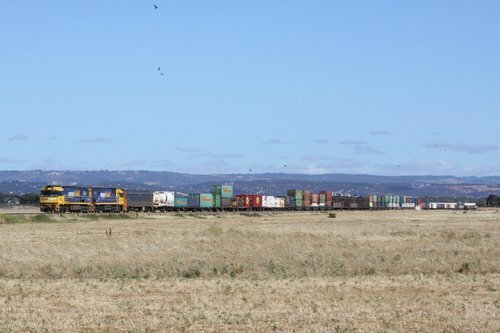 Freight trains headed west of Adelaide often have triple-decked car carrying wagons attached, which carry vehicles consigned by commercial transport companies. 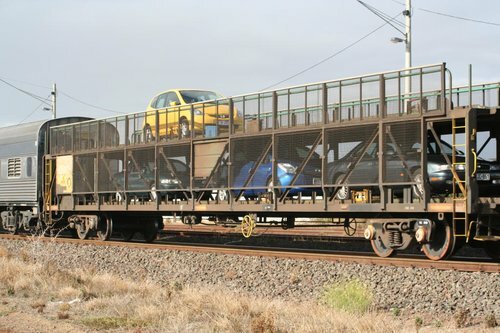 Cars also get carried on freight trains inside special containers – they allow two decks of cars to be carried. The pricing raises some questions – also note that there is the option for cars to travel unaccompanied, at an extra cost. 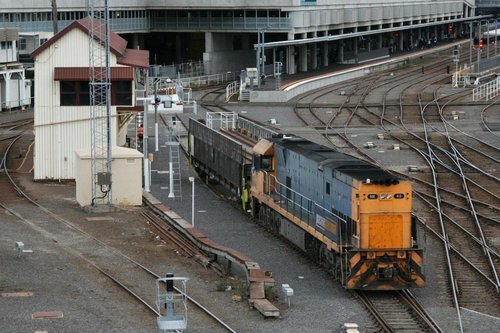 More freight moves from the eastern states to NT / WA then come back the other way, which might explain the reason for the different fares based on which way you travel. 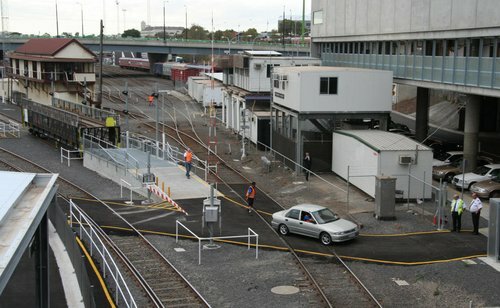 Perhaps lots of car dealers ship their new cars to customers by rail, so GSR can charge more to take advantage of them? Despite height clearance isn’t an issue past the tunnels of Adelaide Hills; the height limitation only allows “stock” height vehicles ex. rooftop racks and tent on GSR services even when a little relaxed on the Ghan services and still lower then a “double stacked” container. Put it this way I did try to plan to 4WD around the Top End next year after the roads open up after the wet season, so in a rig which has been slightly raised (to the maximum allowed height in Victoria) it would be cheaper for me to fly up to Darwin and met up with the vehicle transported by Ceva logistics, then is for me to drive to Adelaide and hop on the Ghan and its motorail service, then at Darwin find the local suspension place to do a swap-a-roo back into the after market “raising” parts. Of course… plan B is travel by Rail to the Top End and buy a second hand most likely ex mine 4WD and hope its not a lemon and lasts another 3-4 weeks of more punishments on the rough tracks then sell it before I head south. Still having restrictive height requirements in ‘double stack’ territory is interesting. I was thinking they might have them just in case there is only room for your car to go on the lower deck, but that doesn’t really make sense – as it would apply to all routes. You need to have a pretty good car to make it the large distances in Australia. I remember going on family holidays towing a caravan up to Port Headland in the early 80s and to FNQ in 1986. Car took a lot of punishment. It is much cheaper to fly these days but there are still touring musicians and such who have to travel between cities. You can get your car put on a flatbed truck and bought over for around $600. Jeez, Unaccompanied Motorail costs a lot! I figured that the rail operators have decided that if they can’t compete on cost, they should try to make a killing instead!